We had the opportunity to interview Rachel Davis, one of Canada’s top fitness models. She currently lives in Burlington, Ontario, Canada and has appeared in magazines such as STRONG, Oxygen, Shape, Runner’s World, Muscle Mag, FLEX and Muscle and Fitness Hers. She has also been featured in several ad campaigns. Rachel is a true success in so many ways. But most importantly, we think she defines the ideal that many women strive for — smart, strong, feminine, determined, fun and down-to-earth. In our interview with Rachel, she reveals some amazing fitness tips; her take on New Year’s resolutions; what she eats day to day; her frustrations with clothing; her take on self-image; how she stays in such amazing shape; her favorite indulgences (yes she has them) and much more! Q) How long have you been training? A) I started training seriously in 2007 for my first competition. Q) How did you get into fitness modeling? A) I got into modeling by complete accident! Meaning, it was not my intention. After competing for 2 years, I decided to book a photoshoot because I was petrified of cameras and getting my photo taken. Well I ended up shooting with Paul Buceta. We submitted the photo’s to Oxygen Magazine and within 2 weeks I was shooting print work for them. The rest is history! Q) What fitness magazines have you appeared in? A) STRONG Magazine, Oxygen Magazine, SHAPE Magazine, Runner’s World Magazine, Muscle Mag, FLEX Magazine, and Muscle & Fitness Hers. Q) Do you work in addition to modeling? Yes, I work full time for Fit Foods. It’s a Canadian distribution and manufacturing company for sports and health supplements. I am the account manager for the Greater Toronto Area. Some of lines include PVL, PVL Essentials, North Coast Naturals and MUTANT. Q) Do you set New Year’s resolutions? If so, can you share your health and fitness goals with us? A) I don’t really set “resolutions” but I set goals. Last year, for example, my goal was to get a Cover. Well I was extremely blessed to have landed 2 covers in the same year. This year my goal is to learn a new language. It is something I have been thinking about for the past year and I am ready to commit! Q) Can you give our readers a sample diet? What would you typically eat in a day? A) I eat somewhat unconventionally according to the fitness industry standard. Typically, these are the foods I consume on a daily basis: protein powder, chicken breast, egg whites, whole eggs, greek yogurt, ezekiel bread products, whole wheat pasta, oatmeal, red skin potatoes, honey, fruits, baked natural chips, MCT Oil, Natural peanut butter, coconut oil, almonds, avocado, low fat cheese, kale, spinach, broccoli and brussel sprouts, tomatoes, onions. 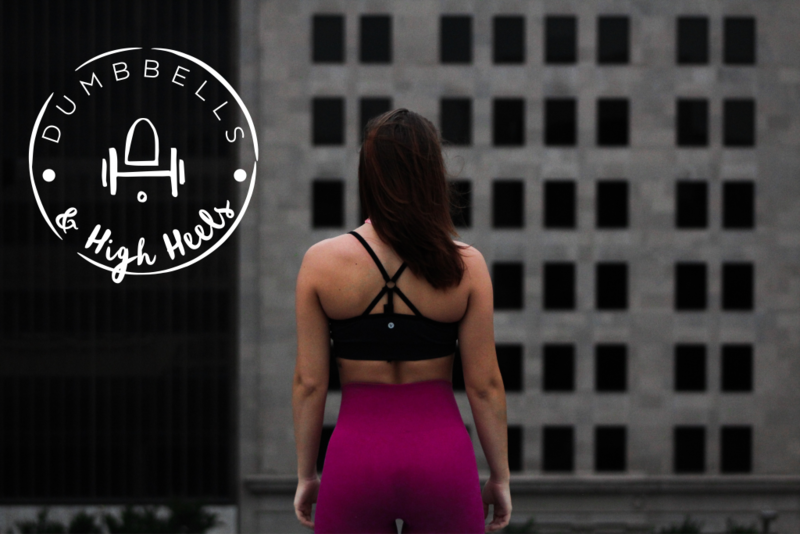 Q) Dumbbells and High Heels is a fitness, fashion and beauty blog. Our goal is to help women look and feel their best. Do you have any favorite beauty products/regimens that you’d like to share? A) I don’t know if I have a specific product that I like, but in general I love lipstick and lip glosses. A pop of colour can spruce up any look, in my opinion! Q) Do you like clothes/shopping? With such an amazing physique, do you have an easy time buying clothes? Why or why not? A) I definitely like shopping, but it depends on what kind of clothes — lol! I have a really hard time shopping for dresses and I’m still trying to find my “brand”. More often than not my back is too wide for the dress and my arms are too big. It’s funny because I don’t considering myself THAT muscular that I would have a problem with this… But I do! Q) Are there any areas of your body that you don’t like or wish you could improve? Q) The media makes it difficult for women to feel good in their own skin. As a fitness model, do you feel pressure to look a certain way? What kind of advice can you give to women to improve their self-image? What makes you feel empowered? A) Yes. I feel pressure at events (tradeshows) to look a certain way. With me it is difficult because I do have that competition background. Once you look your absolute best, you tend to always compare yourself to that look, and I think others do too. It’s hard to have that look on a constant basis. And if you don’t look that way, you can feel “out of shape”, when in reality, you are far from it. Positive self-image starts with having a conversation with yourself… saying that you deserve to feel happy, confident and comfortable in your own skin. And truly mean it. Set small REALISTIC and ATTAINABLE goals. Do not compare yourself to others. Compare you vs you. One of my favorite things to say is “Strive for progression not perfection.” Learn to congratulate yourself no matter how small the improvement or accomplishment may be. You must acknowledge the positive to continue progressing. I truly believe that. Q) What type of advice can you offer women who want to get in shape for the new year? A) I recommend progress pictures so you can see your journey and hold yourself accountable. But, again, I would set small ATTAINABLE goals. Acknowledge you accomplishments no matter how small, because they are NOT insignificant. Be consistent and committed to your plan. This truly is the key to success. Nutrition is 80% of your outcome 20% training. You will screw up. Accept that. One of my favorite analogies; if you accidently drop your cell phone, do say “Omg it’s ruined. Might as well smash it to bits” and stomp all over it? No, you don’t. That would be ridiculous. Same rule applies for diet. If you screw up, you screw up. Don’t throw the entire day out the window and have whatever you like. It took me a while to learn this myself! Remember that analogy. Q) What keeps you motivated to eat clean and work out consistently? A) Hard to say! I have my moments where I feel unmotivated just like anybody. I just have that argument with myself and make myself go. Even if it’s a small workout, it is still better than no workout! I also don’t eat clean 24/7. As you saw earlier, I allow myself to have things that are considered “no-no’s” like pasta, cheese and bread on a daily basis. But I will have moments where I will indulge. It’s all about learning to incorporate those moments and foods into your lifestyle. I follow a macro system so that I can incorporate certain foods into my plan without going overboard. Q) If you were to indulge, what would it be? Playing on her iPod: Sublime, Rage against the machine, The Pixies, Kanye, ASAP Rocky, Kendrick Lamar, Naughty By Nature, Public Enemy, Kid Rock (not even kidding LOL) Robyn, Avici, David Guetta…… so you can definitely say I’m pretty mixed! Favorite place she’s been: Jamaica for my wedding!!!! Hmm…… I’m a super dork, laugh pretty much all the time, except the mornings. Don’t talk to me in the mornings. I am known to sing in the shower and have my friends and husband secretly record (cough cough Jodi and Dorian). I can knit. Lipstick and track pants are favs. My hair is naturally curly.